When it comes to personal cleanliness, most people have no trouble choosing a favorite between bar soap and body wash. Whether you’re fiercely loyal to the old-school bar cleansers, or a dedicated user of the liquid stuff, you may want to weigh the advantages and disadvantages of both products to see which is actually better for your skin. You may be surprised. Moisture – If one of your biggest complaints about bar soap is that they appear to be more drying to the skin than body wash, you’re correct. 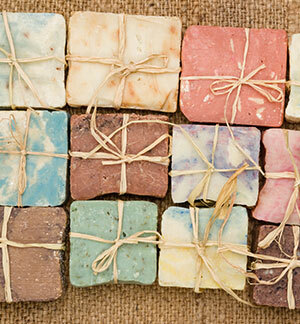 Many bar soaps have a higher pH level than body wash, and contain sodium hydroxide, which can dry out your skin. This is especially true of cheap, drugstore brands. Body wash, on the other hand, deposits rich moisturizers that stay on your skin long after the liquid has been rinsed off. Even if preserving your skin’s moisture is one of your top concerns, don’t bid farewell to bar soap just yet. Many higher quality bar soaps are now formulated with synthetic detergents and hydrating oils that prevent the bar soap from sucking all the moisture from your skin. Dove bar soaps, for instance, contain one-quarter moisturizing cream to hydrate your face and body. Sensitive/Problem Skin – If you suffer from sensitive/problem skin, or you’re allergic to fragrances, you may think bar soap is the only way to go. Not only is there a wider selection of sensitive, fragrance-free bar soaps on the market, bar soaps generally don’t leave behind the same pore-clogging film that body wash does, which is especially important if you have acne and want to prevent future breakouts. Body wash users, however, will be happy to know that there are a few liquid soaps that offer soothing skin relief. And since liquid soap is generally milder than bar soap, there’s less chance of skin irritation if you have issues with dry skin or eczema. Exfoliation – Whether you use bar soap or body wash, exfoliating daily can be a great way to maintain healthy skin. The important thing is to choose a cleanser that invigorates your skin, and strips away the bad stuff without getting rid of the good stuff. Although both bar and liquid soaps can contain exfoliants such as sea salt, sea kelp, oatmeal, and microbeads, liquid soaps have a slight advantage since they’re typically used more often with exfoliating body sponges instead of washcloths. Hopefully the information above will give you something to think about when you go to purchase your next bar of soap, or bottle of body wash. Since we all have different skin concerns, it’s great to know that there’s a cleanser to meet your needs, no matter what your preference is. Keep in mind, if the health and beauty of your skin is your main concern when choosing a personal cleanser, skip the cheaper, drugstore knock-offs and choose a quality soap that will benefit you more in the long run.